“Mindfulness meditation has been reported to enhance numerous mental abilities, including rapid memory recall,” says Catherine Kerr of the Martinos Center for Biomedical Imaging and the Osher Research Center, Harvard Medical School (HMS). Meditation impacts the alpha rhythm, the brainwave believed to screen out everyday distractions, thus making it easier for more important information to be processed. The working memory is the little drawer of the brain where new information is temporarily stocked. When you find out someone’s name and occupation, those details will be kept in your working memory until you no longer need them. If the information is important to you, it will be stored in the long-term memory and recalled later. How does meditation improve memory? Have you ever tried to find your soccer ball from high school in a garage full of unlabelled boxes? Meditating on a regular basis increases your capacity to set your attention, to store the information of your choice and label it accordingly. Now, imagine that your mind is an organized wardrobe. How easy will it be to recall a certain information? 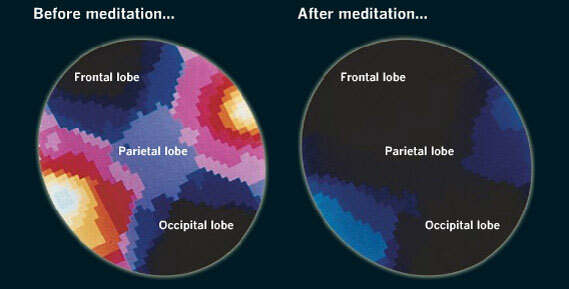 During meditation, the beta waves indicating that our brains are processing information, are extremely reduced. Our brain stopping to process information as actively as it normally would results in not focusing on each and every external stimuli in our surrounding. Knowing that the human brain can interpret images that the eye sees in just 13 milliseconds, you can only imagine the quantity of information our brains are bombarded with on a daily basis. So, in a world where everything is bearing information and meaning, one has to be picky about which information is memorised and which not. “Our discovery that mindfulness meditators more quickly adjusted the brain wave that screens out distraction could explain their superior ability to rapidly remember and incorporate new facts,” continues Catherine Kerr. During meditation, one learns to focus on one thought at a time. By practising on a regular basis, you will soon learn to discern between what is it that you choose to consciously remember and what is, actually, not that important.